Blackened seasoning is a potently fragrant and flavorful seasoning blend with a black pepper and paprika base. This type of seasoning is a popular spice blend when grilling fish or chicken, so why not try it on some vegetarian and vegan grilled tofu? 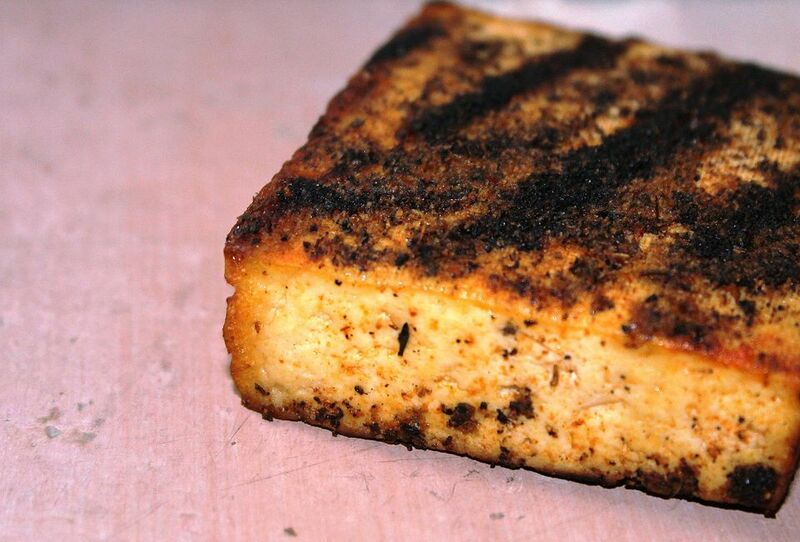 If you like blackened seasoning, try this grilled tofu with blackened seasoning. You could also pan-fry the tofu instead of grilling if you'd like. Looking for more healthy vegetarian barbecue ideas? Here's what to grill for vegetarians. First, prepare your tofu. Like most vegetarian tofu recipes, this tofu recipe will taste best if you press the tofu first. This allows the tofu to absorb more of the flavorings and seasonings which you add to it. Not sure how to do that? See this easy step-by-step guide: How to press tofu. Slice tofu into four thick pieces, about 1-inch thick. Place soy sauce in a shallow pan and add the tofu. Allow tofu to marinate for at least 30 minutes (more is fine), turning once or twice to marinate the tofu evenly. Make a blackened seasoning mixture by combining the paprika, pepper, salt, garlic powder, onion powder, cayenne pepper, oregano, and thyme in a small bowl. Remove the tofu from the soy marinade and dip each side into the blackened seasoning spice mixture, making sure the tofu is generously coated with the spice mixture. Don't skimp - this is where all the good flavor comes from! Grill on a ​medium-hot grill for about 4-5 minutes on each side, or until done. You could also pan-fry your tofu in a few tablespoons of oil. Enjoy your blackened grilled tofu!